There’s two welcome guests in the garden right now. One tall, one short, both green and both scented. Some may think they are stinky, but it’s a wonderful stinky to be sure. Oddly enough, the “stink/scent” is almost the same from both flowers. A few stems of pure white Lily of the Valley. It is especially intoxicating in the early evening. It’s a wonderful thing to walk in your yard in the cool of the day and catch a whiff on the evening breeze. The two of whom I speak are Solomon and Lily, last names Seal and Valley. They always appear as dance partners in late Spring. They arrive to give us one last pleasant performance of the freshness that is Spring before it starts to roll into the laziness of summer. We were lucky enough to inherit both plants, in healthy populations, on the property where we currently live. I have since successfully spread both to other places not only within our yard but also to different counties in Nova Scotia. Just call me Docaitta Appleseed. These two plants couldn’t be any more different, but at the same time similar. After all they are (slightly) related. 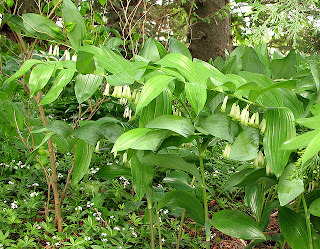 Solomon’s Seal (Polygonatum commutatum from the family Asparagaceae) is a colonizing herbaceous perennial that is native to North America. The plant consists of a single stalk (upwards of 3-4 feet) with alternate simple leaves. 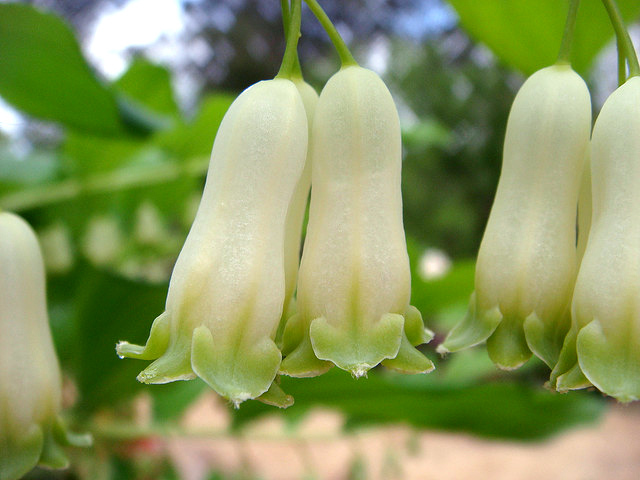 The stem is arching, green and the flowers (shaped like pairs of little hanging bells) are white with a frill of green at the mouth. The somewhat fleshy flowers have a sweet fragrance which can be appreciated by bending over and lifting them to your nose. It is not a scent that travels far. It is a significant attractant to bees, as they can almost constantly be seen hanging upside down gathering nectar from the flowers. It is also attractive to hummingbirds. Solomon's Seal blooms hang in pairs. If happy where it is growing, Solomon’s Seal is a bit invasive (but that’s OK…).The plant sprouts from thick rhizomes that are right at the surface much like bearded irises. They can be divided successfully in Autumn, but I have pulled up chunks and relocated them from Spring through to late Autumn, even when the plant was in flower, with little adverse affect. 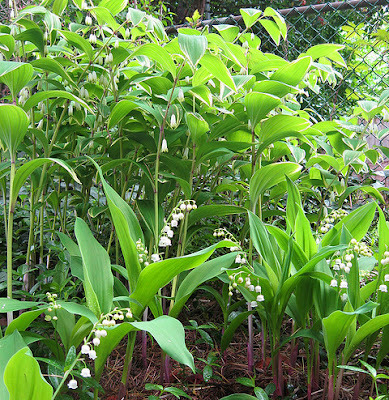 Some Solomon’s Seal are edible, the shoots being cooked like asparagus and the rhizomes after a spcial treatment being a good source of starch. Unfortunately our local plant, “communatum,” is not so avoid ingestion. Solomon Seam makes a dramatic and exotic looking backdrop to the garden. They are supposedly deer and rabbit resistant but if eaten off are extremely reliable to come back the next year. I don’t know if the deer and rabbits are as lucky, knowing the plants are poisonous. If you do find too much of this desirable plant on your hands it is an easy feat to give it away. It’s a beautiful plant that is very impressive. 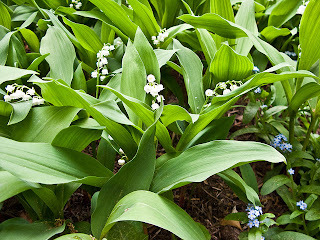 Lily of the Valley grow singly so to really have a display you have to either plant very closely, or be patient enough for the creeping rhizome to spread it naturally. This feat would take several years I imagine. 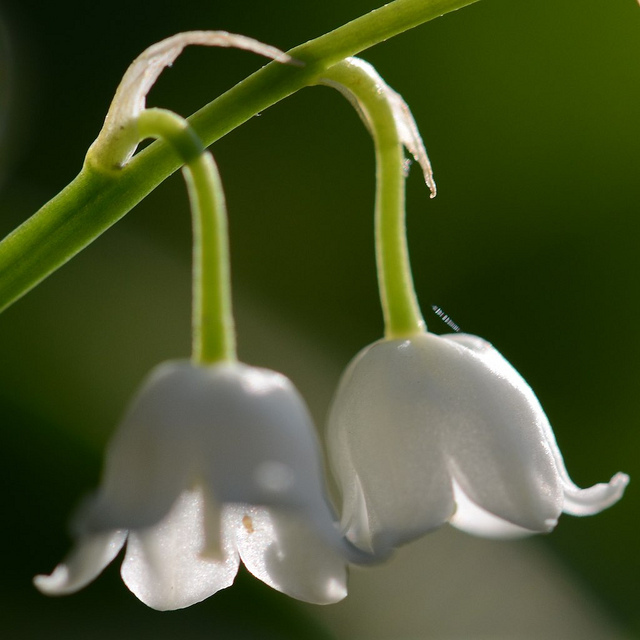 Lily of the Valley is poison. All parts. No exceptions. It contains Glycosides. At one time an extract of the plant was used medicinally as a heart stimulant but that now has been replaced by digitalis (foxglove). Poisoning symptoms are increased heart rate and blood pressure, and if enough has been ingested, cardiac arrest. So best if you don’t eat it. 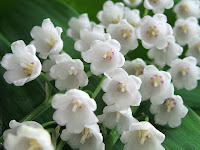 That’s OK, as it is more than a pleasure to enjoy in the garden or as a sweet scented bouquet on a kitchen window ledge. These two partners of Spring are sure to please if you grow them in your garden. Both are shade tolerant although from my experience seem to enjoy some sun during the day. 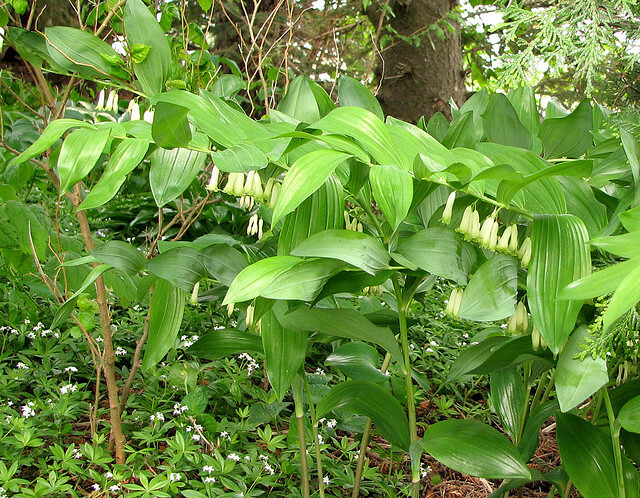 The Solomon’s Seal likes to multiply quickly once it approves of its location, and the Lily of the Valley can be coaxed to do so as well with good quality, nutrient rich soil. I would suggest that you first attempt to “borrow” some from a friend or neighbour. If you have to resort to purchasing either plant they both are quite easy to find.